Click on 2 or more cubes of the same color to make them explode. Clearing multiple cubes gives you more points. In Advanced levels new colors will appear making the game more difficult. 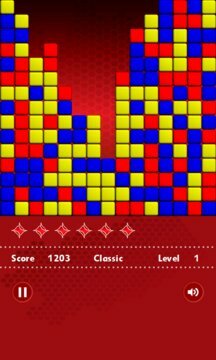 Destroy all the cubes in the screen to complete the level. Use the magic star to clear a single cube. Start with 6 magic stars but you can win a new one every 10.000 points. New colors appear in advanced levels. The game ends when you run out of magic stars and you can no longer destroy cubes by groups. 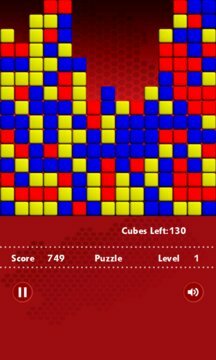 Clear the requiered number of cubes to complete each level. Check the number of cubes left. Clear a certain number of cubes in a giving time. The game ends when you run out of time and you did not destroy the amount of cubes required. Clear a certain number of cubes from each color in a giving time. Clear a certain number of cubes in a fixed amount of clicks. The game ends when you run out of clicks and you did not destroy the amount of cubes required. Clear a certain number of cubes from each color to complete the level. New cubes will fall from above. The game ends when a cube reaches the top. Clear a certain number of cubes to complete the level. A new row of cubes will appear from bellow after a certain time.